March 4-- William C. “Bill” Cumbie, Age 87, of Vidalia, died Saturday, March 2, 2019, at the Community Hospice House in Vidalia, after a brief illness. He was born in Lyons on August 8, 1931, to the late Alton Benjamin Cumbie and Caroline “Carrie” Clifton. He graduated Lyons High School, attended Georgia Military College and graduated from the University of Georgia. After graduation he entered the Army and served twenty years, retiring as a Lieutenant Colonel. His tours of duty included two tours of Vietnam, a three year tour in Germany, a four year tour in Hawaii, and tours at Ft. Holabird, Ft. Benning, Ft. Bragg, Ft. McPherson and Ft. Campbell. Honors include Bronze Star, Meritorious Service Medal with Oak Leaf Cluster, Army Commendation Medal with Oak Leaf Cluster, Vietnam Service Medal with four Bronze Stars, and Parachutist Badge. After retiring from the Army, he obtained a Masters Degree from Georgia Southern in Education and later, a Masters Degree from the University of Georgia in Marketing Education. He retired again in 1992 as a school teacher after teaching at Toombs Central High School and Vidalia Comprehensive High School for a total of sixteen years of service. He worked as a tax appraiser for Toombs County for three years and later served on the Toombs County Board of Registrars. He served in the Vidalia Lions Club holding positions as Lion Tamer, Tail Twister, Secretary-Treasurer, Vice President and eventually President. 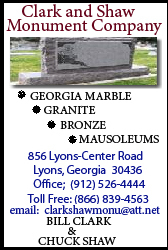 He was one of the individuals instrumental in the forming of the Toombs County Historical Society, serving one term as President. Bill was preceded in death by his wife, Evelyn Louise Cravey Cumbie, whom he married in 1958. Also, he was preceded in death by his brother and spouses, Alton Benjamin Cumbie Jr. and wife Ann of central South Carolina, James Daniel Cumbie and wife Nancy of Lufkin Texas; sisters and spouses Carolyn Raiford Plyler and husbands Harlan and Hugh of Vidalia, Martha L. Daniel and husband Hines of Bellville, and Joan Bedingfield and husband Bates of Greenville, South Carolina. Mr. Cumbie is survived by his two sons, Michael Charles Cumbie and wife Jamie of Athens and his children, Andrea D. Cumbie and husband Sumeet Singh of Washington, D.C. and Allison M. Cumbie of Orlando, Florida; and Keith William Cumbie and wife Len and their children, Jacob L. Cumbie and Amy M. Cumbie, all of Dahlonega; and numerous nieces and nephews. The funeral service will be held Monday, March 4th at 11:00 a.m. in the chapel of Ronald V. Hall Funeral Home with Reverend David Blalock officiating. Burial will follow in Lakeview Memorial Gardens. The family will receive friends at the funeral home on Sunday evening from 6:00 until 8:00. In lieu of flowers, memorial contributions may be made to the Wounded Warrior Project, P.O. Box 758517, Topeka KS 66675 or the Community Hospice Foundation, P.O. Box 2277, Vidalia GA 30475.